The Grasshoppers tennis club is located behind the block of flats at 87 The Drive, Hove. The tennis club courts are only just visible from the road. 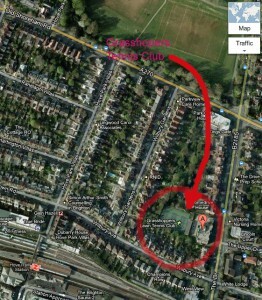 Click the map image below to see the Google Map for how to find us. You cannot ever park outside Grasshoppers, you must park on the road. The roads in the area around the club are in the Brighton and Hove Controlled Parking Zone area ‘O’ which operates between 9 a.m. and 8 p.m. Monday to Saturday; you must buy a parking ticket from a pavement vending machine. Sunday is free! The only parking allowed in front of or inside our gates, except during off peak times during the day, is for people on club business collecting or delivering club related materials. There is free parking just north of the Old Shoreham Road. Once at Number 87 The Drive (marked as “A” in the above map) walk down the driveway (walking over ‘Private’ painted on the road) and Grasshoppers tennis club will reveal itself once you are behind the building. By bus: number 21 stops almost outside the club. By train: Hove station is very close and can be seen at the bottom left of the above map. When you leave the station turn left and go north over the footbridge into Hove Park Villas. Take the first right (Wilbury Avenue) and the second left (The Drive). Walk past the block of flats at 87 The Drive and take their driveway (walking over ‘Private’ painted on the road) and Grasshoppers tennis club will reveal itself once you are behind the building.